This weekend, I felt like I had fallen into a Group of Seven painting, not unlike the way C.S. Lewis’ and Madeleine L’Engle’s characters get to jump around into past and future eras. When I placed the heavy leather tumpline of a loaded toboggan across my chest, and leaned into the blowing snow, I got sucked into another era, one long before the combustion engine, tourists and Mountain Equipment Coop. 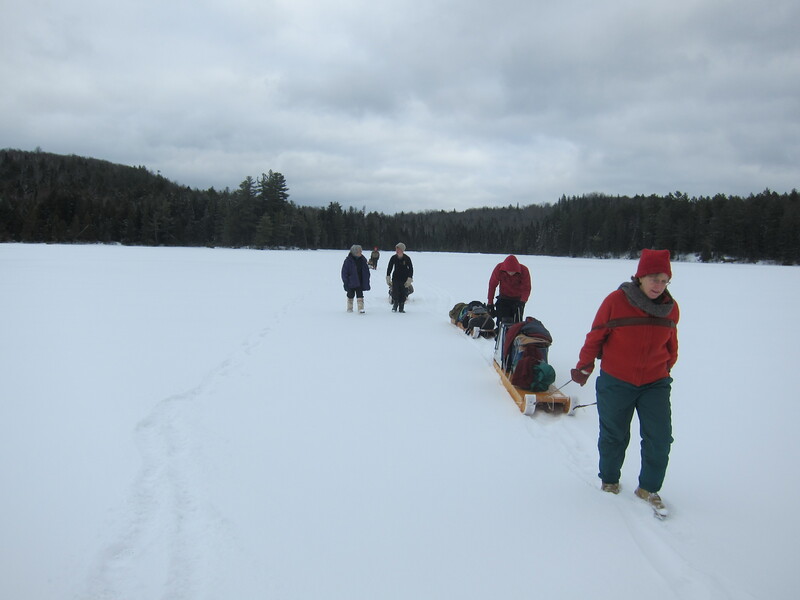 I’m just warning you, in case you decide to go winter camping with Craig and Doris MacDonald in Algonquin Park in the middle of January. No slick synthetics, and no lightweight titanium snowshoes or tents on this trip. Nope. Lash on the old-fashioned babiche and wooden snowshoes with a few feet of lamp wick and follow the ancient trail that the first white man recorded in 1827 near the park’s East Gate, beyond the gargantuan virgin pines. 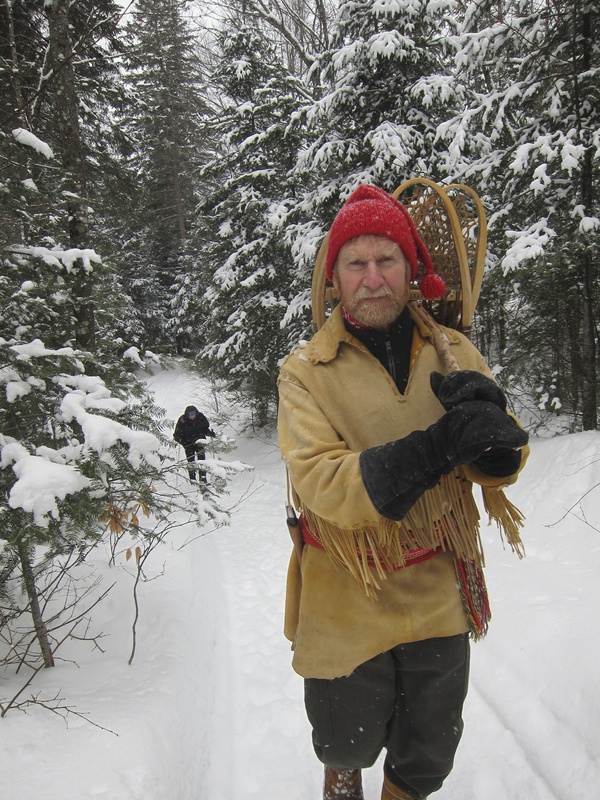 It leads to Sunday Lake where you’ll find Craig, master winter camper and expert on Algonquin Park and on the old ways of the Natives and the traders. He comes from generations of northern postal carriers that were more comfortable in snowshoes battling a blizzard than you and I are in our slippers sitting by a fireplace sipping a latte. We are eight people camping together in the snow. No slackers allowed. It’s a race against a setting sun. A rough, six foot chisel and two metal pails are handed to my son who heads for the lake. “Don’t forget to pile snow on the top of the filled pails so the water won’t slosh all over your legs. And don’t lose the chisel in the lake!” Doris yells out. Someone searches for firewood and bark. My husband and other son stagger out of the forest and into the campsite after retrieving caber-size poles that Craig lashes together to make a structure to which we tie the locally made Egyptian cotton tent. 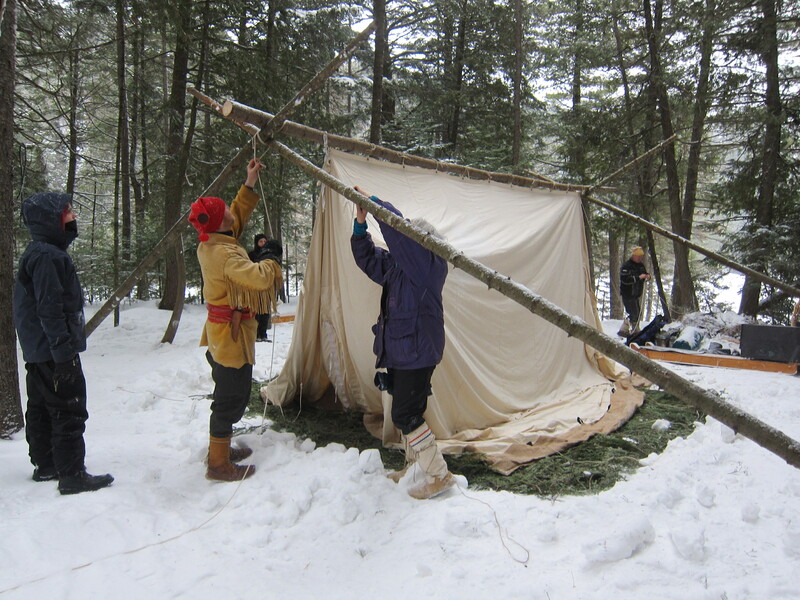 Before my dazzled eyes, the exact shape of the tent in Tom Thomson’s painting The Tent begins to take shape. It’s cream coloured, spacious and gracefully proportioned. Doris is showing us how to weave a soft fragrant carpet of balsam boughs, the way the Native people do. Craig and Wayne, who still wears the traditional voyageur garb, hook up the stove whose skinny chimney pipe angles up through a metal square in the gable end of the tent. A fire is crackling and, in no time, the tent is heating up. A toboggan, placed in the centre of the tent, becomes our table. Wooden stakes that hold candles are driven into the ground. Soon, we are sitting in our T-shirts, eating home baked bread and chili and swapping stories of adventure and travel, especially tales of Craig’s interactions with the Natives in years gone by. Before I climb into my sleeping bag, I slip outside. The tent is glowing like an old-fashioned Aladdin lantern turned down low. The snow is hard and crisp and the temperature is dropping as the night darkens. It is dead silent and perfectly still. So, this is how those Canadian painters did it a hundred years ago. Well, Tom Thomson, there’s still one painter who is thrilled to be camping, your style, in 2014. It always happens every year, that irksome restlessness that comes after a period of too much stimulation. It seems to take me forever to calm down after all the excitement of Christmas when the house bulged with guests and rocked with music and merriment, and our bellies protruded with too much gourmet food. So, I end up doing nothing. I am suspended like a hummingbird before a feeder, wildly whirling my wings but going nowhere, then, erratically sipping at this feeder and dashing off to that flower. No matter how many firm talks I give myself about focus and self-discipline, and no matter how many noble quotes I read about success, I just can’t seem to get very far on any project. Matters came to a climax this afternoon when I found myself rarely alone for a few hours on a Sunday. It was the perfect time to start blogging again. A full pot of hot rooibos tea before me, and a blank Microsoft page open, I waited eagerly for the gates to creativity to swing open. But, they didn’t. I hadn’t a clue what to write about, just like I haven’t had a clue, since Christmas, what to paint on the enormous stack of blank canvasses in the corner of my studio. With each passing minute, the anxiety increased. It was time to take a walk. My quiet country road weaves through the forest and traces the rugged contours of the Algonquin Highlands. I couldn’t help noticing that a raccoon, a grouse, a mouse and a fox had, each, gone for a walk not long before me. Why, even a car had made a new tread pattern in the snow part way up the road before the driver lost his nerve and turned around. The top, wispy branches of the naked maples were gently sweeping the clouds to the side so I could enjoy glimpses of the startling blue sky. A playful breeze pinched my cheeks and rattled the dry beech leaves clustered tenuously on saplings. Nervous nuthatches fluttered noiselessly in the branches while a hairy woodpecker hammered relentlessly at a tree trunk until it offered up a bug. I noticed, when I sat down again to my cold tea and computer, that the gates to creativity had mysteriously opened in my absence. Ideas and words flowed easily and I was able to write. For me, a brisk walk in nature is the best cure for just about anything. The world outside my studio today is a grey, cast-iron caldron of popping popcorn and I am peeking over the rim watching the fluffy stuff jump, swirl and pile up and up. I wish those white blobs were edible. My lunch date at my friend’s house was cancelled due to this big snowfall and I’m starving. Like her, most of us in Muskoka live isolated at the end of windy, hilly, back roads that are not plowed very often. When it snows like this, we just learn to change plans quickly and sit tight until we can budge. Thankfully, I don’t have to budge for another hour. Tom Allan is playing Vivaldi and I am reminded just how well Vivaldi and snowy days go together. The two seem to be mimicking each other with their pristine, joyful dances. It is a great joy just to see the snow finally return to Dorset. It certainly took its time this year and I was beginning to worry that global warming was going to deprive me of one of my favourite painting subjects. I love it when the winter snow dresses the trees like royalty in stately mantles of ermine and lays down a thick spongy carpet over the impassible, debris-strewn forest floor. Snow transforms it into a smooth, white desert that I can stride easily across on racket-shaped snowshoes into the remotest of places. As I watch the first big snow come down in Dorset, I think of A. Y. Jackson’s First Snow Algoma, of A. J. Casson’s big blobs in First Snow, Grenadier Pond and of Kathleen Moir Morris’ snow-laden Montreal scenes. Many Canadian painters have even managed to sneak those beautiful snow shapes into their spring and summer paintings. Whether they were put there subconsciously or intentionally, they are there. Just have a look at Lauren Harris’ clouds and Arthur Lismer’s blossoms in Georgian Bay, Spring. What about Tom Thompson’s Lily Pads? I bet those painters were longing for the snow to come back soon after the spring melt. A gallery owner once advised me not to paint winter scenes. “They don’t sell,” he said. He might have just as well told me not to be Canadian. Snow is the trademark of so many Canadian painters. My hour is up. I must go out into the popping, dancing whiteness and find my son for his violin lesson. He will be playing a Vivaldi concerto for his teacher this afternoon.